Antonio Meloto or “Tito Tony” to the countless Gawad Kalinga volunteers and community partners was born on January 17, 1950 to a low middle class family in Bacolod City, Negros Occidental. At a young age, he was already exposed to the squalid living conditions of the poor, his home being near a shoreline squatter community where poverty was already very pronounced. Tito Tony’s natural acumen provided him the opportunity to be an American Field Service scholar, where he took his senior high school year in De Anza High School in Richmond, California. But his big break came when he qualified as a Full Academic Scholar of the Ateneo de Manila University. His college years were dedicated to preparing for a career that would take him and his family out of the poverty of his past. After he graduated in 1971 with a Bachelor of Arts degree in Economics, he was offered a position as the Purchasing Manager of Procter and Gamble. Eventually, he built his own name as an entrepreneur. It was in 1985 that Tito Tony’s life took a different path that eventually led him to the inspiring work of Gawad Kalinga. He became an active member of Couples for Christ (CFC) and quickly rose in leadership, becoming instrumental in the setting up of the CFC Family Ministries in 1993. This expanded the reach of the mission beyond couples, to include children, youth and young professionals. It was during his assignment as the Country Coordinator for Australia that he felt the powerful call to start the work with the poor through a youth development program for gang members and juvenile delinquents in Bagong Silang, Caloocan City. Since it began in 1995, the program has now evolved to become Gawad Kalinga, a global movement that builds integrated, holistic and sustainable communities in slum areas. Gawad Kalinga is now being implemented in almost 2,000 communities in the Philippines and in other developing countries such as Indonesia, Cambodia and Papua New Guinea. It has become a concrete manifestation of the healing of relationships in the Philippines, bridging the gap between the rich and the poor, government and the private sector by simply bringing back what is uniquely Filipino – the spirit of ”bayanihan,” the willing sharing of any heavy load for the good of his fellowmen. Driven by a strong commitment to faith, GK is able to bring out the hero in every person by giving him concrete opportunities to serve. 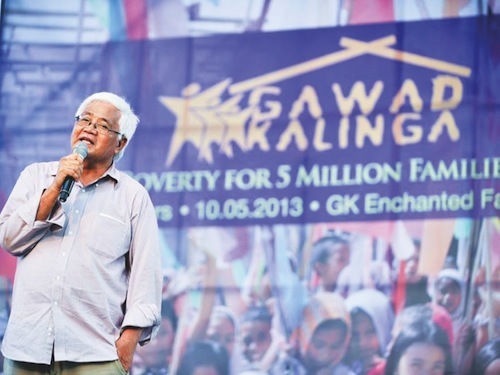 Gawad Kalinga sparks hope in the dream for a poverty free world – one family, one community and one country at a time. This is Tito Tony’s passion. A true man for others, he has inspired not just his family but hundreds and thousands of volunteers throughout the country and the world to work towards building model communities where the poor can thrive and attain to their fullest potential so that together, we can all look forward to a better future for our children and the generations to come.